It’s more of a common story than you might think. A person has some sort of accident… or act of malice done to them… or an intentional harm to themselves. The person slips beneath the surface of some body of water and immediately fights for the surface again because that is our body’s natural instinct. Panic sets in as the burning and pressure builds in the lungs. The need for air is overpowering. Finally, as the end draws near, the body loses its will to fight for life and the soul prepares to depart, much like an involuntary surrender to the inevitable. It’s the end of a life underneath the surface of water. A generation passes. Life goes on and people mourn the loss. Eventually most of the people who knew the poor drowning victim pass into the afterlife as well. Maybe two or three generations pass. The drowning victim decides to give a go at life again. Rebirth. Only this time, he or she is reborn with baggage from the last moments of the previous life ending in such a torturous way, although there is not likely to be literal memories of the incident or any thought of reincarnation at all. But the demon of the drowning manifests itself in the new life as a phobia of water. An unexplained and horrifying fear of water overcomes the person each time they are faced with the prospect of swimming. What is probably passed off as a random phobia or fear of the unknown actually has its roots in not letting go of the terror the previous body felt in the process of drowning at the end of the last night. Of course, this is just one example of a phobia born of a past life. This one is the one I see the most in my research. 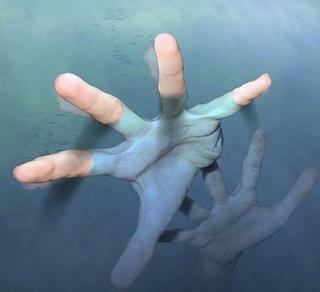 Drowning does not always result in a phobia in the next life though. It all depends on the advanced stage of the soul and the ability of that soul to resolve old issues before carrying them into the next life. The range of hydrophobia is wide as well. I’ve seen some hydrophobia resulting from reincarnation ranging from basic nightmares but still having the ability to get into water, to such paralyzing hydrophobia that the person struggles just to take a shower. Additionally, people have to be careful not to assign every phobia to originating with an incident in a past life. I only look into past life causes if every present life cause has been explored and exhausted. Naturally, if, for example, you were mugged at gunpoint a few years ago, a phobia of guns would probably develop from that moment and there would be no need to investigate further back into your past life history. Most common things like a fear of spiders simply boils down to a fear of the unknown, fearing creepy crawly things, and learning to be afraid of it from watching parental figures being afraid of it. My grandmother is afraid of spiders, so my mother grew up watching that fear and learned to fear spiders as well, and so on through me now being afraid of spiders because of them. There is no need to look into past lives for the causes of phobias when you can trace the steps back to some point in your present life. Since arachnophobia originates with my grandmother, I would, if I was looking for a way to help her, try to find the cause in her. Was it this life? If I can find no logical cause in her present life for suffering from arachnophobia, that would be the point where I would begin looking into her previous lives for a cause. That’s just an example though because I can’t read people that close to me. Why bother finding out if your phobia originated in a past life? I usually tell people not to open that can of worms if they’re just looking for something interesting or like a parlor game. It is like going through a process of counseling and that process can be quite painful. I usually get people at the end of their rope who have tried everything else to overcome their phobia, including traditional psychiatry. The reason why I help people with their phobias originating in past lives is to give them guidance in letting go of old trauma so they can move on from it. That’s the only reason to open the can of phobia worms – the intention to work for freedom from it. My mother was one of these drowning victims that was born into her present life with hydrophobia. She has nightmares sometimes of her death by drowning quite a long time ago. Through our work in spiritual matters, she has been able to work through it enough to get waist deep in the ocean but no further than that. She used to not go into the ocean at all. There has been progress in that regard. Sometimes simply understanding the cause of the phobia allows for some relief in the symptoms of anxiety and terror. Once a person understands why they are afraid, then it’s important to go through exposure to the thing that causes the fear, but that should be done with someone who understands the situation. Exposure to the phobic trigger is necessary to overcome it. I can’t snap my fingers and make it go away for you, nor could a psychiatrist or hypnotherapist. You have to be willing to go through exposure and discomfort to overcome your fears but only once you understand their causes. In my case, I was born with a deeply paralyzing fear of guns and cannons. It is a true phobia to the point of disrupting otherwise pleasant activities like fireworks on the Fourth of July. Since I can remember, I have associated weaponry or sounds like weaponry with the imminent demise of people I love. It was never fear for my own life. It was always fear that people I love would be killed. Most of my life was marked by staying indoors during fireworks displays, never allowing my mother to keep guns in the house, and panic attacks at Civil War reenactments. Additionally, I’m extremely anxious in crowds and phobic of being trampled or separated from my loved ones. There were no causes for these phobias in my present life, as the symptoms have been present since I was born. Over the years I found ways to cope with my phobias like always hanging back at the end of a crowd, visiting sutleries during battles so I don’t have to look at the reenactments, not looking directly at weapons in museums, etc. In my early 20s, I began to realize that my phobias came from two separate past lives. I have been in violent mob situations twice – once during the New York City Draft Riots of 1863 and before that, during the French Revolution. I was not on the streets of Manhattan during the Draft Riots but I was trapped in my hotel on the edge of the rioting for days. The army rolled cannons into the hotel lobby and in the park across the street, prepared to fire into the mobs should they get any more out of control. During the French Revolution, I was swept up in a mob ready to storm a royal palace, separated from people I knew and knocked to the ground, almost trampled to death. These events have repeated in many nightmares. I also suspect that I associate the imminent demise of my loved ones when I see or hear gunfire because of the Civil War and the fact that my husband was nearly killed. There is nothing so terrifying for a woman as sitting by your husband’s bedside watching him hang between life and death for months. The symptoms of my phobias have lifted a bit, although I’m still very fearful of weaponry. I have been able to sit through fireworks displays in the last eight years or so but it is not without fighting my fear every moment. It takes work and exposure to overcome it. If I go a year or so without going to a reenactment, the phobia is much harder to control than if I was going every couple of months. The most important thing is to teach yourself to remember that what trauma befell you in past lives is just that – something in the past – and it’s not likely to happen again. Overcoming the voice of panic from the past is the key. >This is very interesting I have a terrible fear of knives like if someone is fooling around with a knife I get really scared that they are going to stab me or something will happen to me with that knife and when that happens I have a coppery taste in my mouth….Could never explain this because I have never had anything happen to me with a knife…So maybe I was stabbed to death in another life I tend to lean toward the 1800's and the Egyptian era….Thanks for sharing this info very interesting…. >I am terrified of slugs.. LOL I think I just despise them because they are slimy and gross. I trully am fearful of going over bridges and it became much worse when I had children.I have never been a person who suffers from anxiety however on the 4th of July one year my son was standing on the bridge looking over with his dad to the water below and I FREAKED. I just knew he was going to fall over. I was shaking and nearly in tears. Hmm I wonder?? >Ever since I can remember I have hated it when something is tight around my neck or even touches my neck. I can't wear high necklines and just thinking about wearing a scarf makes me cringe. When you did my past life reading I was not surprised to find out that I had been killed by having my throat slit in another life. Oddly enough, since learning this I have been less sensitive about things touching my neck. Dogs. Dogs really scare me. And this is kinda odd cos my grandparents had a pey. I must have been 5, or so, ans shed come tk greet us n id be scared. I used to put yummy stuff k her food. But dogs really scare me now. I usually turn around n take a detour.